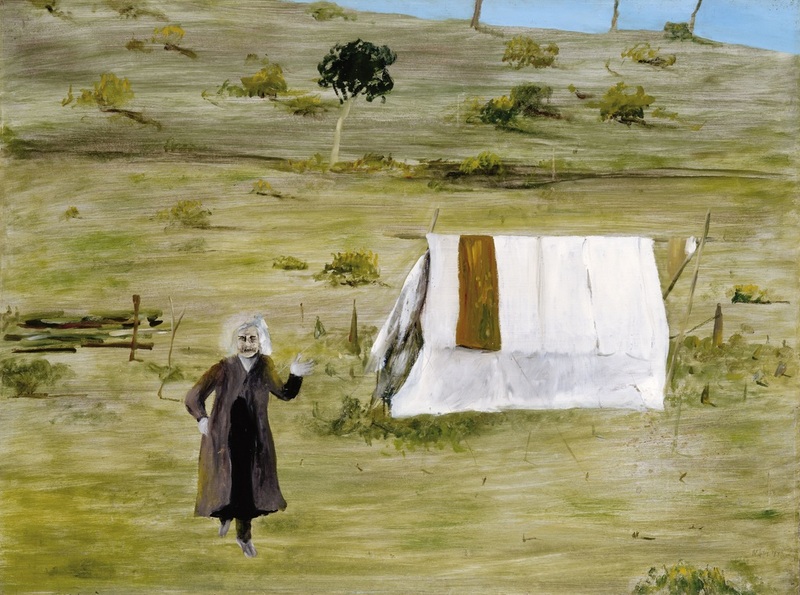 In July 1946 the Melbourne Herald published a story about an eccentric old woman called Mrs Carroll, and Nolan based this painting on a photograph of her that was printed in the newspaper. Mrs Carroll was an impoverished fringe-dweller who flouted convention and resisted authority. She lived in a tent for seven months, eventually saving enough money to acquire the land she squatted on in Melbourne. When Nolan painted this work Australia was still recovering from the effects of the Great Depression, and Mrs Carroll is emblematic of the hardships many people experienced during the post-war period. Although Mrs Carroll appears diminutive against the vast barren landscape the painting reveals her brave and indomitable spirit.